JACKSONVILLE, AL (WBRC) - The tornadoes that swept through Jacksonville a year ago Tuesday damaged more than just the JSU campus. They also destroyed a Dollar General, a Chevron Food Mart, a small grocery store, and the sanctuary of West Point Baptist Church. All but the church have been rebuilt. But they also left their mark in two nearby neighborhoods full of homes. They were both located near Jacksonville State, and were so full of debris and such a prime target for looters, they were blocked off at one point for about three weeks. Now, they're partly rebuilt, but not totally. Some are rebuilt but empty, awaiting their families. Some are still tornado damaged and apparently abandoned. There's at least one two blocks from JSU and the school is visible from the house's front yard. Some are still awaiting repairs. James Lister's house is still under construction, having to be rebuilt from the ground up. He tells us he waited a long time before he could find a contractor. “My thoughts on it are, Calhoun County is really a small county. There’s so many homes destroyed in Jacksonville, with just so many contractors and so many guys to go around and do it,” Lister said. Lister, his wife, their daughters and their dogs are living in a rental home until their house is built, and they move back. Lister, the service adviser at a local new car dealership, wouldn’t have it any other way. "Jacksonville may never exactly be the same, but the ones of us who love Jacksonville, we're going to be here," he said. Joseph Scott Morgan is a forensics professor at JSU, and appears on cable news, particularly HLN, when his expertise is needed. He frequently appears with Nancy Grace. That night a year ago, he had just finished an interview with then-HLN news anchor Ashleigh Banfield, via Skype from his usual spot in his home's dining area, then 50 minutes later, two trees had fallen where he had sat. Morgan, his family and their dogs were taking shelter. “We went into the bathroom, interior bathroom, we didn’t have a basement. I put my family - my wife, my son, our dogs, into the bathtub, covered them with blankets, pillows. And I just covered myself with a big blanket in the bathroom, kind of wedged myself next to a countertop,” Morgan recalled. 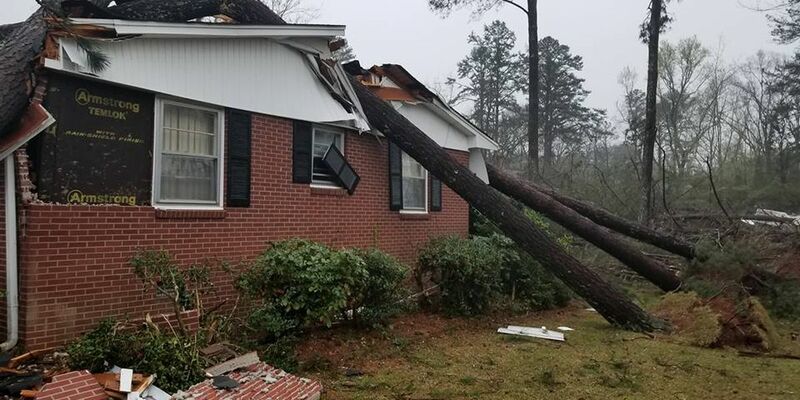 Some 14 to 17 trees had fallen on their 1960s-era ranch home, and the family was trapped in their bathroom until Gadsden firefighters, who came to assist Jacksonville’s first responders, rescued them. “The smell of fresh pine, I can never smell it again and think about Christmas, it permeated the air, we were just completely surrounded by pines, and the smell of gas,” Morgan said. One of those firefighters borrowed a wrench from Morgan to shut off the gas. The firefighter had lost his own wrench somewhere in the tornado damage. A year later, Morgan’s home has been demolished and his family lives behind their old home. His in-laws were supposed to live there, but his father-in-law died shortly after Christmas and the family was still mourning his death when the tornadoes destroyed their home. Morgan says the Jacksonville tornadoes, he believes there were two, have cemented his desire to stay in the city. “We would not have made it through had it not been for the help of Jacksonville as a community, and certainly not the university, because it has been amazing because I’ll have colleagues that I don’t know saying ‘How are you? How is your family?’ And they don’t know me from Adam. They don’t know my family from Adam,” Morgan continued.